Passover is a special time to gather with family and friendly for the traditional Seder and holiday meal. Start a new tradition this year and create some new memories by making this super easy sweet chocolate treat which you can make quickly with kosher for Passover ingredients you likely have on hand: colored sprinkles, your favorite holiday candies (think chocolate nonpareils, candy fruit slices, mini marshmallows, Jordan almonds, etc). 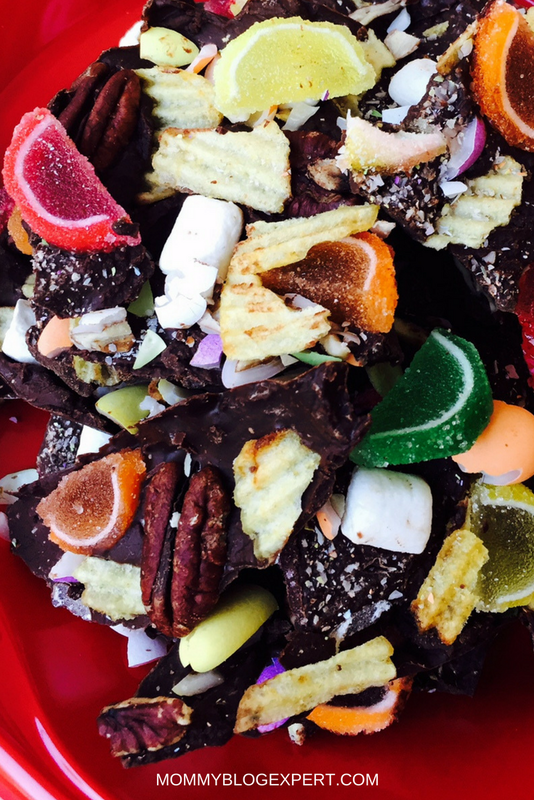 Then, add some crunch and contrast with potato chips, broken matzahs, and/or pecans. Serve this for dessert and chances are your guests will be asking YOU for the recipe! 1. If using mini candies or pecan halves you can leave whole. Otherwise roughly break candies into pieces and place aside in separate small dishes. You can carefully use a hammer to gently break up Jordan almonds, if you're using them. 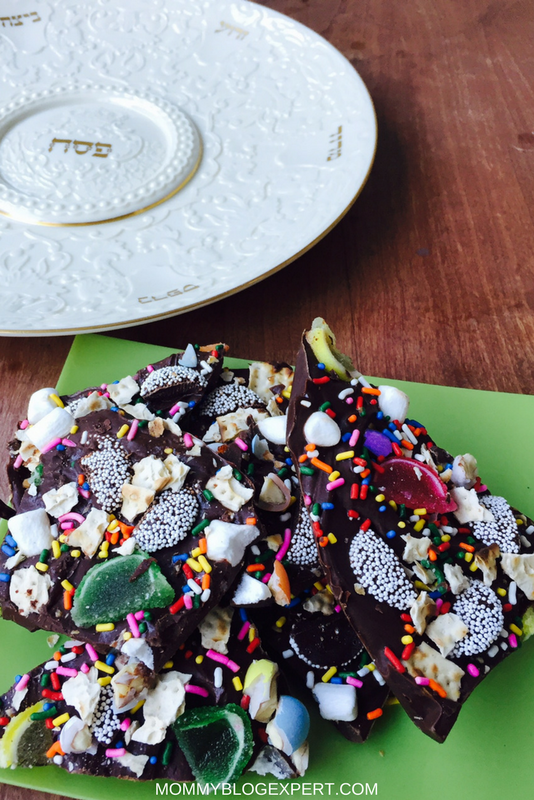 Crunch up the potato chips and matzot and also set aside in small dishes. 2. Break chocolate bars into pieces, 1 inch square or slightly smaller. 5. Microwave on high 1 minute, then immediately remove, add 2 tablespoons of margarine and stir with a metal spoon for a few minutes. If the chocolate isn't completely melted, return to microwave and heat for 30 seconds more, adding more up to 3 more tablespoons margarine to thin chocolate enough to spread. Be careful not to overcook. 6. 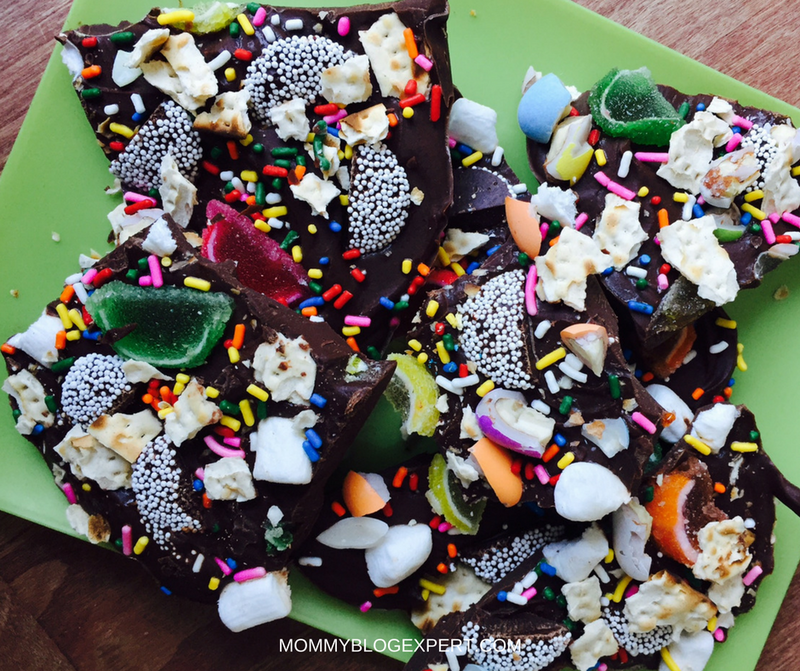 Pour hot melted chocolate onto a 13x9 rimmed cookie sheet pan lined with wax paper or baking parchment paper, using a metal spoon to smooth chocolate to edges. 7. Working quickly, starting with the largest candies, press one type of candy or crunchy item at a time gently into the chocolate so they are still mostly visible and distributing evenly. Continue adding candies, largest to smallest, ending with the tiny add-ins (like sprinkles). 8. Chill 1 hour in refrigerator or until hard. Then, roughly break into bite size pieces and place on a dessert platter and ENJOY! The choice is yours... you can mix and match whatever toppings you'd like to add with equally delish results. 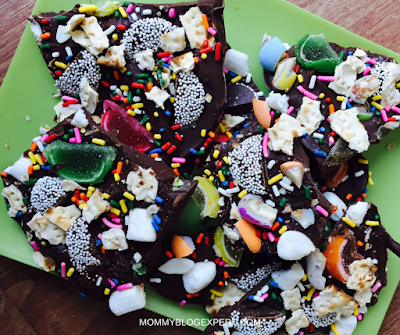 FTC Disclosure: Recipe and photos are by MommyBlogExpert. No payment or other compensation was exchanged in connected with this post. See complete FTC Disclosure information that appears at the bottom of MBE's home page and at the bottom of every individual page including this one. That bark looks so delicious! I can't wait to make this. It's got SO MUCH yummy stuff in it! This looks so delicious! I love making bark of any kind. My kids absolutely love this! I am gonna have to make this soon. This looks so delicious and easy to make. I will have to make some with the kids this weekend. I am sure this will be a big hit this weekend. We are having a bunch of family over to celebrate Easter. I love to make treats like this. I already have everything I need to make some. I will have to get the kids to help. Loving the use of bittersweet chocolate. People rarely use it on these bark recipes and I think it is the very best. My kids will love these. Perfect dessert for any family and friends gatherings. I am loving the combination of sweet and salty. This bark looks absolutely delicious.